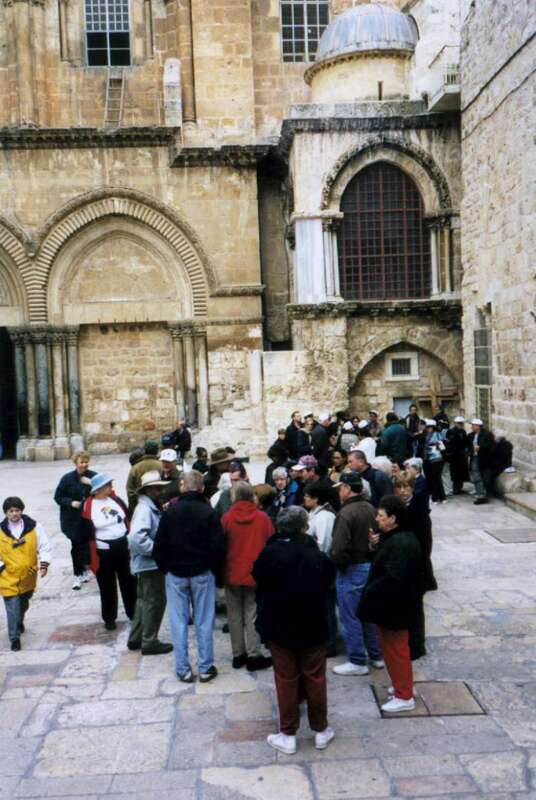 Here is our group in the courtyard of the Church of the Holy Sepulchre. We have just walked on the Via Dolorosa or "Way of Pain" where Jesus is thought to have carried his cross on the way to his crucifixion . This church is thought by many Christians to be the actual site of the crucifixion of Jesus. Inside over the tomb is a magnificent dome with radiating yellow leaves, opening in the center which I liken to "the eye of God" which forever views the tomb of Jesus. Something else very interesting here. Notice the ladder in the upper left hand corner of the photo? I had never noticed this until I received an email from James E. Lancaster who told me about his website (click HERE) which gives a most unususal history about this ladder! Take a look! You will be amazed. This is the power of the Internet!